This past year saw the electric car inch closer to being a practical vehicle instead of a curiosity. The Nissan Leaf crawled through its second full year with lower-than-expected sales, but it also had more competition. The Leaf and Mitsubishi i-MiEV were joined by a luxury car (Tesla Model S) compacts (Ford Focus Electric, Coda) and even an SUV (Toyota RAV4 EV). Production numbers for some of these models may still be small, but at least green car drivers have more choices available to them. 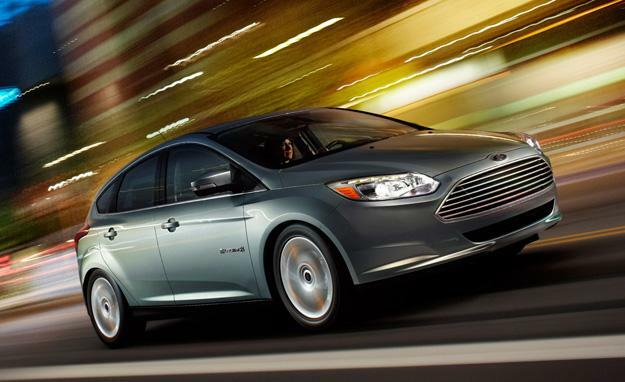 Here are those choices, the Best Electric Cars of 2012. Tesla Model S: Starting from the top, the Tesla Model S is by far the most expensive EV available, but it’s also the only one that can claim to be a legitimate luxury and performance car. Tesla prices the car based on the size of its battery pack, but even the smallest version offers more range than any other EV. The base model costs $57,400 and comes with a 40-kWh battery pack, netting a 160-mile range. Another $10,000 nets a 60-kWh battery pack and 230-mile range. 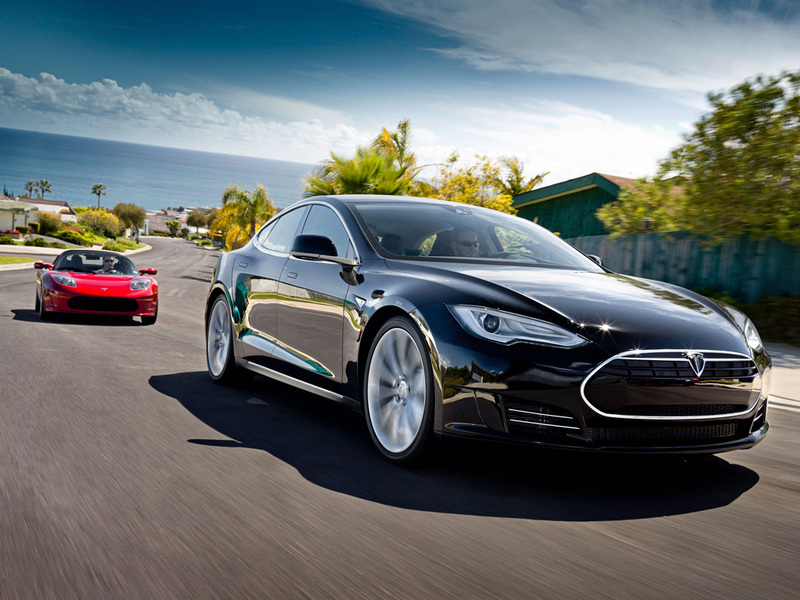 The biggest battery pack, 85-kWh, gives the Model S a 265-mile range and starts at $77,400. Tesla prices will increase by $2,500 on January 1, 2013. Tesla’ Supercharger charging stations also promise 150 miles of adde range in 30 minutes. The Model S doesn’t just ease range anxiety, it also turns anxiety into excitement. It can run from 0 to 60 mph in 5.6 seconds, or 4.4 seconds (the same as a BMW M5) with the Performance package. Mounting the lithium-ion batteries in the car’s floor also yields a low center of gravity and increased interior space. Topping it all off is a leather-lined interior with a massive 17-inch touch screen. Nissan Leaf: The Leaf was the first mass-market EV and is still the best option for the most people. It’s EPA-certified midsize interior and $35,200 base price put it right in the middle of the EV field. That money buys a 110 hp electric and a 24-kWh lithium-ion battery pack. 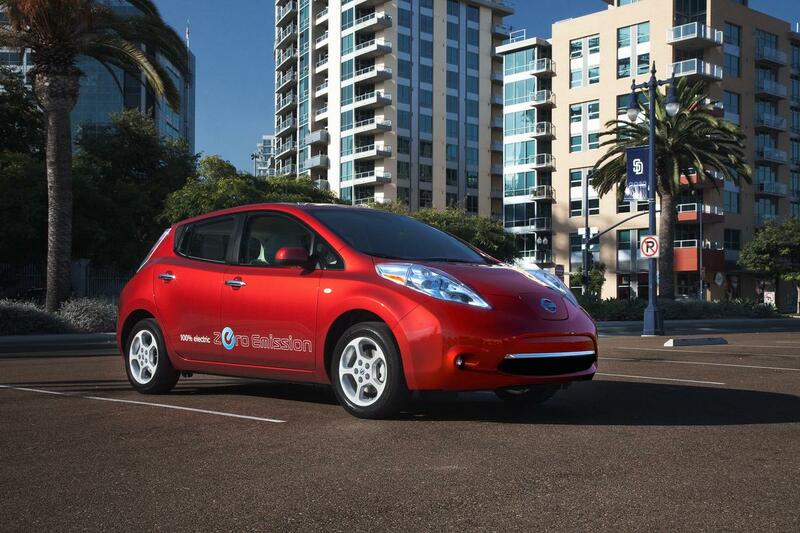 Open the Leaf’s nose, and an optional 240-volt charger can recharge the battery in as little as four hours. The Leaf is no sports car, but with a top speed of 90 mph it shouldn’t have any trouble keeping up with traffic on roads with 65 mph speed limits. It’s 79-mile range is still among the highest in the EV world (excluding the much more expensive Tesla) and no one will ever mistake this zero-emission vehicle for anything else. Ford Focus Electric: Ford’s European-style Focus is one of the most stylish compact cars around, so it’s not surprising that the Focus Electric is one slick EV. The Aston Martin-like grille helps, too. The Focus isn’t just a pretty face, though. A 23-kWh lithium-ion battery pack powers an electric motor with 141 hp and can propel the Blue Oval EV to 84 mph and 80 miles on a single charge. An optional, 240-volt Level 2 charger can replenish the battery in four hours. The only major downside is the price: $39,000. That’s a lot to pay for a Focus, even an electric one. Coda sedan: The Coda is the perfect car for the EV driver that wants to fly under the radar. It’s nondescript body is shared with the Chinese Haifei Saibao, which has been on sale since 2004. 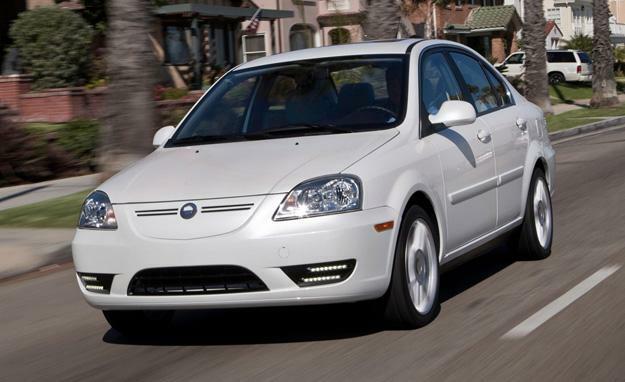 An unstylish ready-made body should keep the price down but, at $36,250, the Coda is slightly more expensive than the Leaf. Still, it’s not unreasonably expensive in the current crop of EVs. That MSRP buys a 134 hp electric motor and a 31-kWh lithium-ion battery pack. The Coda’s range is 85 miles and it has an electronically limited top speed of 85 mph. A full charge from the 220-volt plug takes six hours. 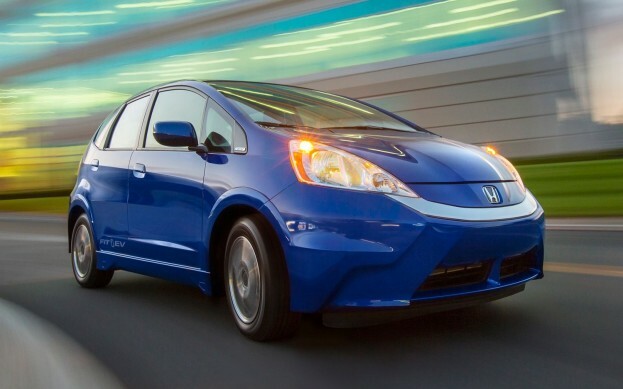 Honda Fit EV: Like the Focus and Coda, the Fit EV is a regular car that’s been converted to battery power. It preserves the regular Fit’s sporty handling and roomy interior (although the folding “magic seats” are gone). The Fit’s hardware belies its small size. The 123 hp electric motor is taken from Honda’s FCX Clarity hydrogen fuel cell car. The 20-kWh lithium-ion battery pack gives the Fit an 82-mile range, and a Level 2 charger can recharge it in just three hours. 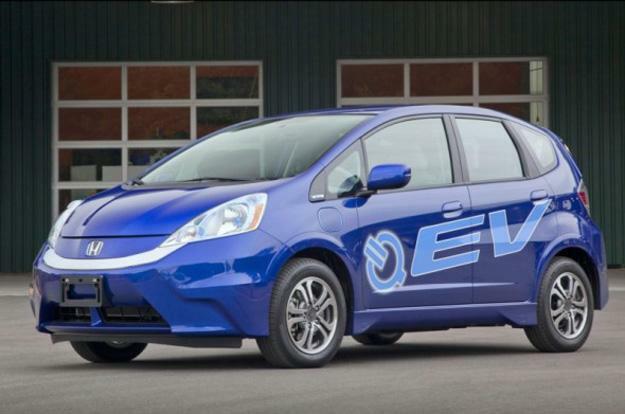 Like the regular Fit, the EV is a very complete car, which is why it’s too bad that Honda isn’t mass producing it. Instead, the Japanese company is leasing 1,100 examples in select markets, including Los Angeles, San Francisco, Sacramento, and Portland, for the equivalent of $36,625. Mitsubishi i-MiEV: Mitsubishi’s little i rolls into its second year as America’s cheapest EV. The i-MiEV’s full name is Mitsubishi Innovative Electric Vehicle, and it certainly is like nothing on the road. The pod-shaped i-MiEV is based on a Japanese kei microcar, and hides its electric motor under the floor to maximize interior space. Still, the Mitsubishi is among the smallest EVs on sale today. It’s small on power, too. The electric motor can only muster 66 hp, while the 16-kWh lithium-ion battery pack can only get the car 62 miles on a charge. Recharging through a 240-volt Level 2 connection takes seven hours. The Mitsubishi i’s main selling point is price. At $29,125, it has a lower base price than any EV currently available. Even a loaded SE with the Premium package costs $35,065, which is still (slightly) less than the Nissan Leaf’s base price. The budget price buys a budget car, but the i-MiEV might be perfect for the EV bargain hunter. 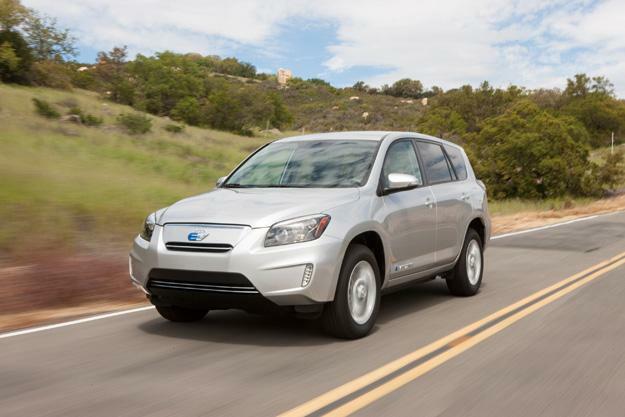 Toyota RAV4 EV: Like the Tesla Model S with which it shares its electric motor, the RAV4 EV is in a class of one. It’s the only new EV SUV available. Toyota has built a RAV4 EV before, but an update seemed like a good idea given the current (no pun intended) popularity of electricity. Toyota outsourced the RAV4’s development to Tesla, which equipped it with a 154 hp electric motor and a 41.8-kWh lithium-ion battery pack. The front-wheel drive RAV4 can cruise to a top speed of 85 mph (or 100 mph with Sport mode engaged) and has a 103-mile EPA-certified range. The extra range and six hour charging time reflect the size of the battery pack, the biggest this side of a Model S.
Like the Fit EV, the RAV4 is not a mass-production item. Only 2,600 will be built, at a cost of $50,610.